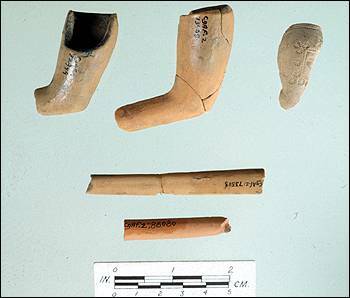 The clay tobacco pipe is an exceptional tool for dating archaeological sites from the historic period because it has undergone a series of stylistic changes over its history of production. The importance of these stylistic changes becomes apparent when one considers that the fragile nature and inexpensive cost of clay pipes resulted in their being smoked, broken and discarded all within the period of a year or two. A large part of the research on clay pipes has dealt with the identification of marks with which makers identified their product. If a particular mark and pipe bowl can be identified, then so can its place of origin, the date range within which it was made and therefore, a basic time frame for when it was deposited. This article deals specifically with the marked clay tobacco pipes excavated from Ferryland, NL, encompassing examples from both the 17th and 18th centuries. The origins of the clay tobacco pipe date back to the 1570s when tobacco smoking first became fashionable in England. According to William Harrison (1573) "In these daies the taking-in of the smoke of the Indian herbe called 'Tobaco' by an instrument formed like a little ladell, whereby it passeth from the mouth into the head and stomach, is gretlie taken-up and used in England" (Harrison as cited in Oswald 1975:3). It is not known for certain whether these early smoking instruments were made of clay, but by the 1590s, there is specific reference to the use of clay pipes fashioned for tobacco smoking (Oswald 1975:5). By the early part of the 17th century, the clay tobacco pipe industry began to develop in many local centres throughout Britain and in many parts of the Netherlands. Most of these locally-made clay pipes had a limited distribution within their area of manufacture but in the cases of port towns and overseas trading centres, some clay pipes were shipped to the North American colonies. These early pipes typically had a short stem with a large bore diameter and a small "acorn" shaped, rouletted bowl that angled away from the smoker. As the tobacco pipe evolved throughout the 17th century, its stem became longer, its bore size progressively smaller and its bowl larger. By the early 18th century, it developed into a larger straight-sided form with no rouletting around the rim and the bowl perpendicular to the stem. Makers' marks found on pipes from both the 17th and 18th centuries fall into two main categories, relief and incuse. Relief marks form a raised mark on the pipe and were either stamped with a die or incorporated into the pipe mould. Incuse marks form a negative impression on the pipe and were stamped with a die or applied by a similar device across which the stem was rolled. One exception is the Chesapeake pipe bearing the initials DK, in which the pipemaker used a hand-held tool to produce the rouletted initials and other decorative designs. Tag reads "Chesapeake Red Clay Pipe from Virginia or Maryland. CgAf-2: 72405, 73513. Planter House before 1696". Photo by Duleepa Wijayawardhana ©1999, Newfoundland and Labrador Heritage Web Site. There are many varieties of marked pipes uncovered during the excavation of 17th and 18th-century historic sites. Therefore, the most important step in identifying a makers' mark is to first look at the pipe fragment from which it came. By studying the shape, size and characteristics of the pipe bowl it is possible to determine a date range for that particular fragment, and perhaps its regional origin. If this can be established, then the next task is to examine existing documentation for listings of pipemakers and collections of marked pipes which have already been identified. In those cases when all you have to go by is a small marked pipe fragment, there are several criteria that can help establish a relative date range and then, hopefully, a positive maker identification. As a rule of thumb, marked pipes from the first half of the 17th century are predominantly stamped on the heel. This is true for both English and Dutch pipes. By the second half of the 17th century, makers' marks on English pipes can still be found stamped on the heel but are also found on the backs of bowls and on the stem. From the end of the 17th until the third quarter of the 18th century, marks are more commonly seen in the form of either a moulded cartouche on the right or left side of the bowl, as initials moulded into the sides of the heel/spur or as an abbreviated name stamped on the stem. In the case of Dutch pipes from the later 17th and 18th centuries, they are distinguished from the English pipes not only by their bowl shape and presence of rouletting around the rim, but also because pipemakers continued to mark their pipes on the heel, often using minuscule marks. Excavations at Ferryland over the past seven years have recovered tens of thousands of clay tobacco pipe fragments. From these collections, all of the 17th and 18th century marked pipes were removed for further analysis and identification. The purpose of this research is to establish a database of marked pipes in the hopes that it will be useful for future archaeologists studying historic sites throughout North America. 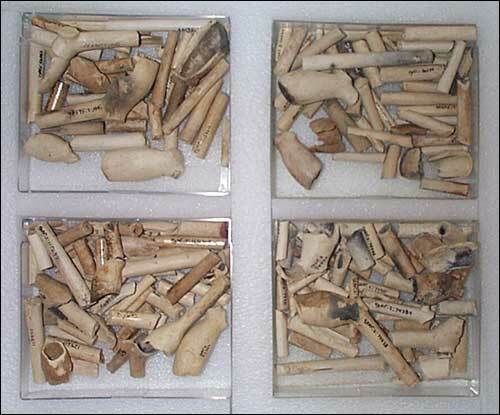 These are some of the thousands of broken stems and bowls from a single 17th century Planter's House. The number of different marked pipes totalled 66, the majority of which date from the early to late 17th century. All marks are ordered from oldest to most recent and, when possible, are accompanied by the corresponding pipe bowl or bowl fragment. The scale of the marks vary due to differences in size. These pipes originated from either England or the Netherlands, with the exception of one pipe from the Chesapeake region of Virginia.